Please refer to our stock # 3265 when inquiring. 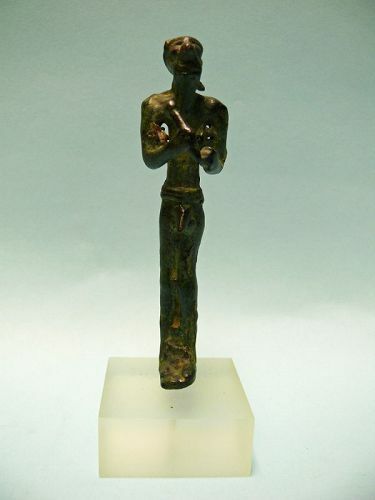 Canaanite Bronze Figure of a Warrior God, ca Early 2nd Millennium BCE. Solid cast figure holding a club in right hand. Standing with feet together. In excellent condition. 4" x 1" x 1", on custom stand height is 5". Cf. Christie's NY 12/18/1996, lot 39. The land of Canaan, which comprises the modern regions of Israel, Palestine, Lebanon, Jordan and Syria. At the time when Canaanite religion was practiced, Canaan was divided into various city-states. Canaanite religion refers to the group of ancient Semitic religions practiced by the Canaanites living in the ancient Levant from at least the early Bronze Age through the first centuries of the Common Era. Canaanite religion was polytheistic, and in some cases monolatristic.